You need to have Windows® Administrator rights in order to install Reply With Templates for Microsoft® Outlook®. Please check that you are running Microsoft Outlook 2002 (SP-2), 2003, 2007, or 2010 as Reply With Templates is incompatible with any Outlook version prior to 2002/XP (SP-2); check other System Requirements as well. You can update your Microsoft Outlook version here. 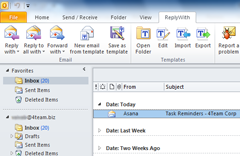 Download the latest version of Reply With Templates setup file and save it to an easy to find place.